- Sold as Private Sell Christie's, London March, 2014. Private collection, Europe. The painting is listed in the catalogue of Fondazione Federico Zeri (Italy), entry number: 34220, as work of Leonardo da Vinci (circle). Its current location is indicated as unknown. 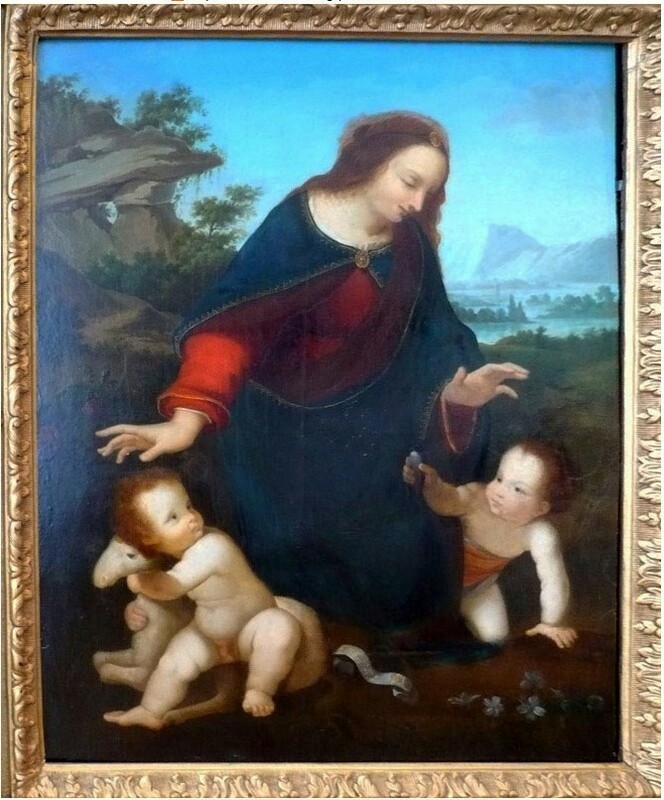 - a picture close in composition to the reviewed work, with semi-circular top, different background and without a lamb (here embraced by Infant St. John), from the Museum of Fine Arts in Budapest, Hungary (Ill. 6). The picture is generally much weaker than the examined one, and thus can also be excluded from the comparison. - there are four other known paintings of the kind, with more significant compositional deviations from the examined one: one in the old collection of Ludwigsburg, one in a private collection in Madrid (by Fernando Llanos? 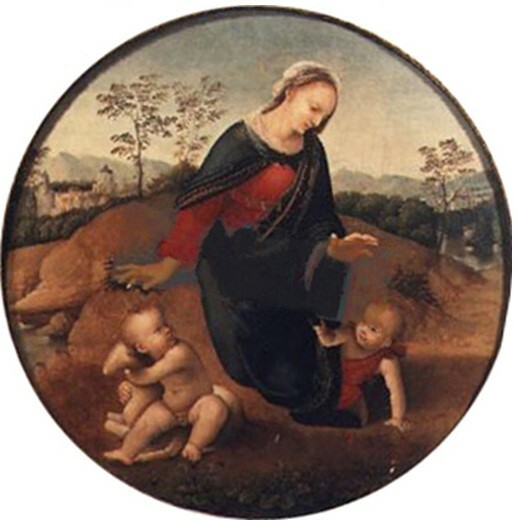 ), and two works ascribed to the little-known pupil of Pietro Perugino – Niccolò Soggi (1480–1552), in private collections of the UK. These paintings will not be considered in the present review. The subject of the painting apparently originates from Leonardo’s graphic heritage. 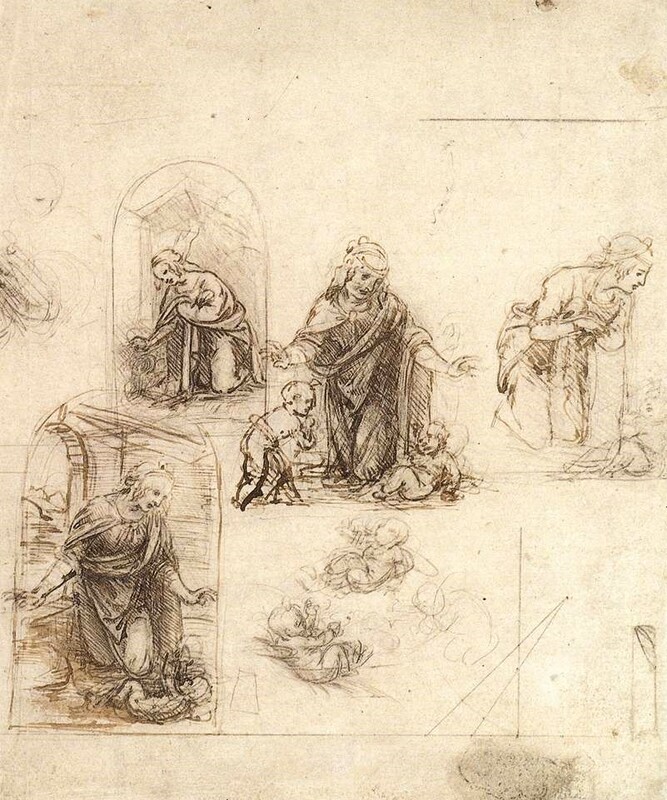 For example, there is a drawing by Leonardo in the Metropolitan Museum of Art, New York close in composition to the figures in the present painting (Ill.7), and another one in the Getty Museum, Los Angeles, showing the master exploring the pose of Infant St. John embracing the lamb. 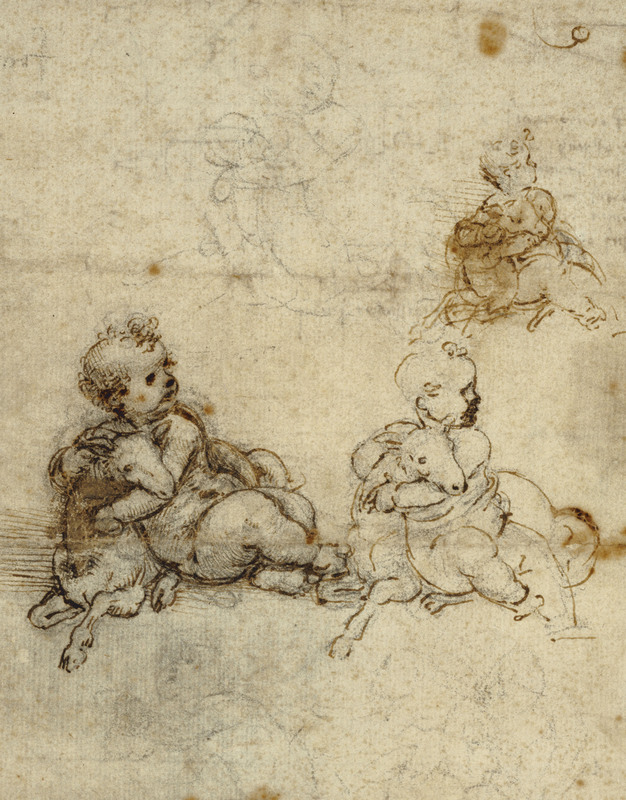 There are several more drawings of a kind: e.g., Ill. 7a shows a sketch from the Royal Collection, London with a rather schematic figure of the Child embracing the lamb. 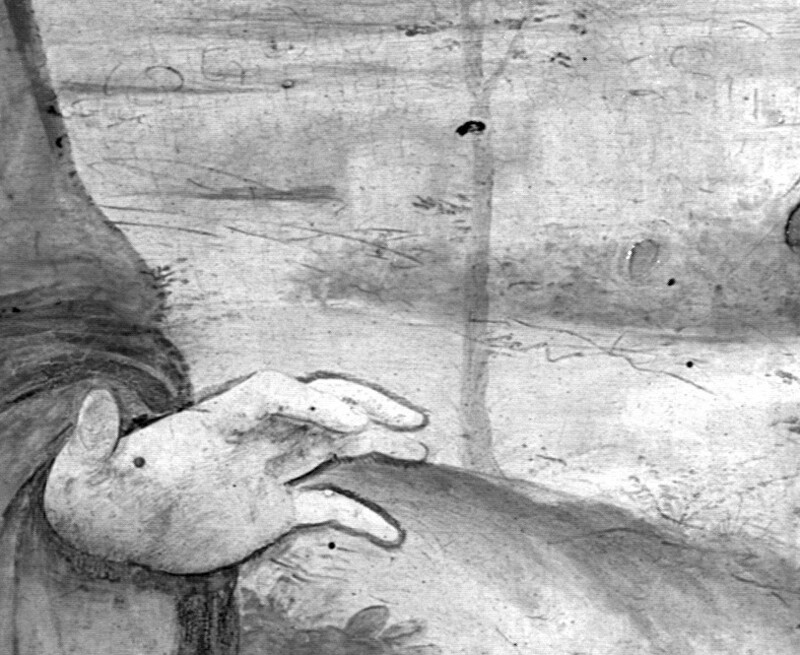 Especially notable are the undetermined position of the lamb’s head and remarkably similar rendition of chubby cheeks of St. John, especially the left one, in the drawing and the painting’s fragment, Ill.7a It is also worth recalling that Madonna's hand in the painting is definitely derived from Leonardo's drawing stored in Galleria Academia in Venice, see Ill.7b. On the one hand, with our knowledge of today one cannot claim that any completed version of the painting by Leonardo’s own hand ever existed, while the surviving “copies from the lost original” demonstrate great variability in the architecture at the background and the Virgin’s clothing. On the other hand, the existing paintings on the same subject could not have been based solely on the small drawings by Leonardo (Ill.7). 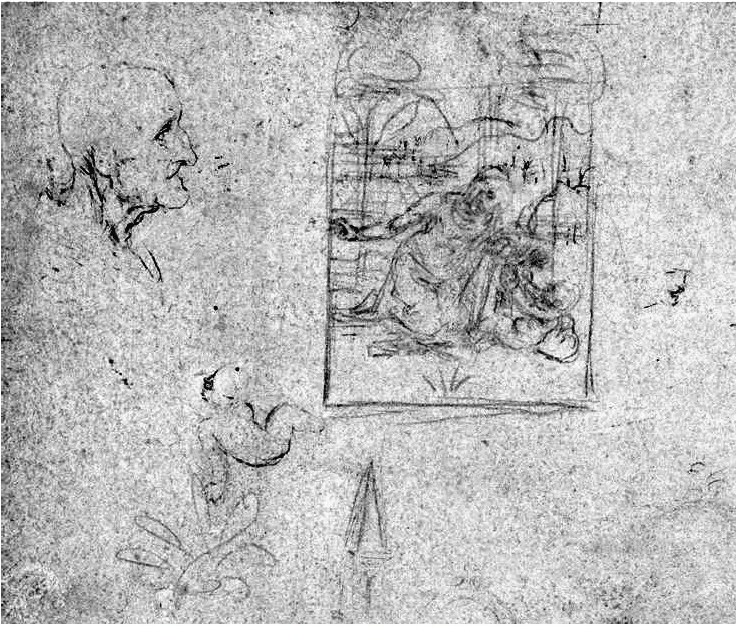 Rather, there might have been a now-lost cartoon or an unfinished painting by Leonardo, in the same format as the existing copies, with well-developed figures and only sketched minor details (like the landscape). The master’s habit of either leaving his works completely unfinished or set aside for many years is well known. Adoration of the Magi or St. Jerome are the most famous examples. Such unfinished paintings could be later completed by his students, the fact that probably explains the endless disputes between art historians on Leonardo’s authorship or mere participation in many of the paintings. We should probably consider accepting this explanation for many of the disputable works that visually “do not make it” to the level of Leonardo but look a little closer to the master than the typical leonardeschi. And here especially interesting are such peculiarities of the studied painting, revealed by the technological analysis, as the ‘reserves’ around the figures left to in-paint the background later, some modifications of the composition, and characteristic features of the sketch that shall be discussed in the technological section of this report. It should be noted that only one version among the above-mentioned paintings is identical to the analyzed one in almost all details, including the landscape and architectural elements. It is the Pitti variant which is presently attributed to Hernando de los Llanos (was known in Italy as ‘Fernando Spagnolo[U1] ’) who, together with Fernando Yáñez de la Almedina, worked in Florence in 1505 under Leonardo’s guidance on the fresco Battle of Anghiari. Upon returning to Spain he produced several copies from Leonardo’s paintings. Judging from its quality, the Pitti variant could be nothing more than a copy of the picture in question, as the latter is undoubtedly a work by a more skilled and masterful artist. If we accept the existing attribution of the Pitti piece and consider that de los Llanos could copy solely from the original Leonardo, the authorship of the studied painting becomes self-evident. Let us turn to the results of the technological analysis without any further speculations on the topic. The Madonna of the Yarnwinder’s composition was especially popular in Spain, where it might have been brought over by Fernando Yáñez de la Almedina or Hernando de los Llanos (whose name also appears as Fernando de Llanos). Both painters were trained in Florence in the first years of the 16th century, and either might be the “Ferrando spagnolo” mentioned as a pupil of Leonardo when the master was working on the fresco of the Battle of Anghiari in the Palazzo della Signoria in 1505. Ill.2 Variant from the Ashmolean Museum, Oxford. Ill.7b. 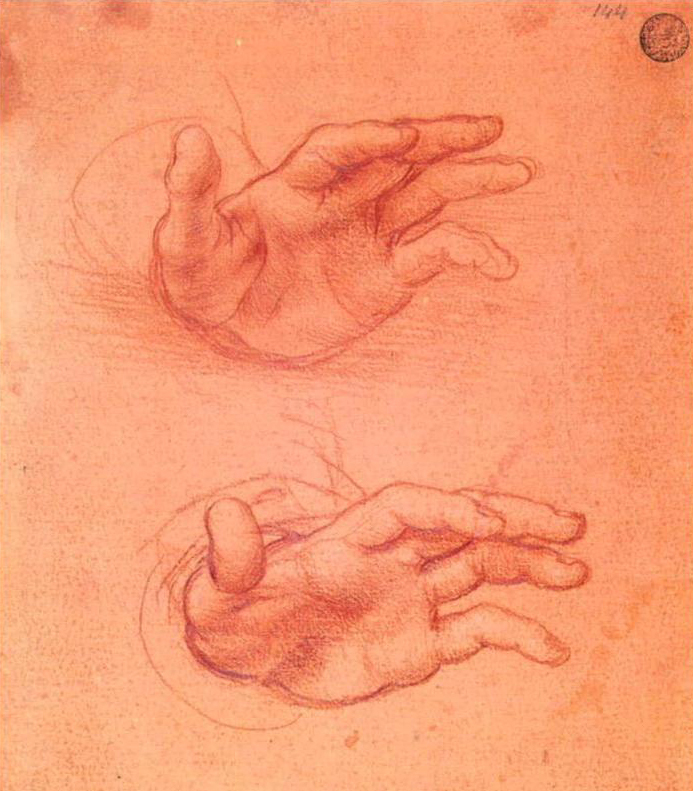 Leonardo drawing of hands (left), Galleria Academia, Venice and Madonna’s hand on the painting under examination (right). - The base is panel, poplar timber. No traces of assembling several panels into one identified. Conical inset spline on the reverse of the panel is not contemporary to the painting and, judging by its type, was probably added in the 17th or 18th century. Reverse of the panel and its IR-reflectography. - The ground is gypsum or anhydrite, the binder is animal glue. The lower layer of ground is of coarse grinding, the top layer is of finer grind. - The main pigments of the paint layer are white lead, azurite (mineral), ultramarine (natural lapis lazuli), lead-tin yellow, copper green (probably, copper acetate – verdigris or copper resinate), carmine, vermilion, charcoal. 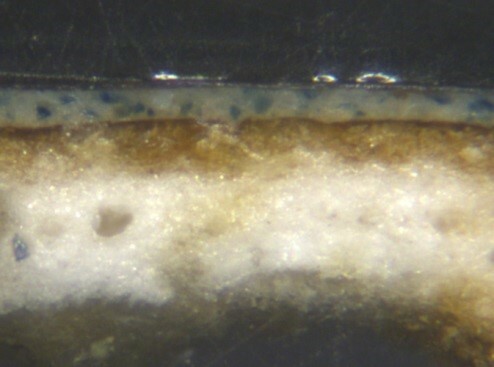 In the structure of the paint layers, one should notice the presence of binder (Ill.8) on top of the ground under the blue paint in the sample taken from the sky area, and its absence in the sample taken from the Virgin’s right hand. It may have been applied as an oil-isolating imprimatura. Absence of such imprimatura under the fleshly parts of the figures (Ill.16) may attest to several technologically different stages of painting’s creation. Ill.8 Crossection (sky). NB: layer of binder under the blue paint of the sky area. The biding media was not specified in Mrs. Silvia Amato of the Courtauld Institute report, but under recent conversation treatment it was claimed that both - oil and egg tempera were present on the painting. Infrared reflectogram (general view) can be seen on Ill.9. The underdrawing is revealed only locally and in fragments. One can assume that the underdrawing was made not in pure charcoal or carbon black but rather with a metal (silver) point frequently used by Leonardo and his students or in a special ink by pen often used by Italian artists in the late 15th – 16th century. In favor of probable use of the silver point may speak approximately equal width and intensity of the drawing lines. 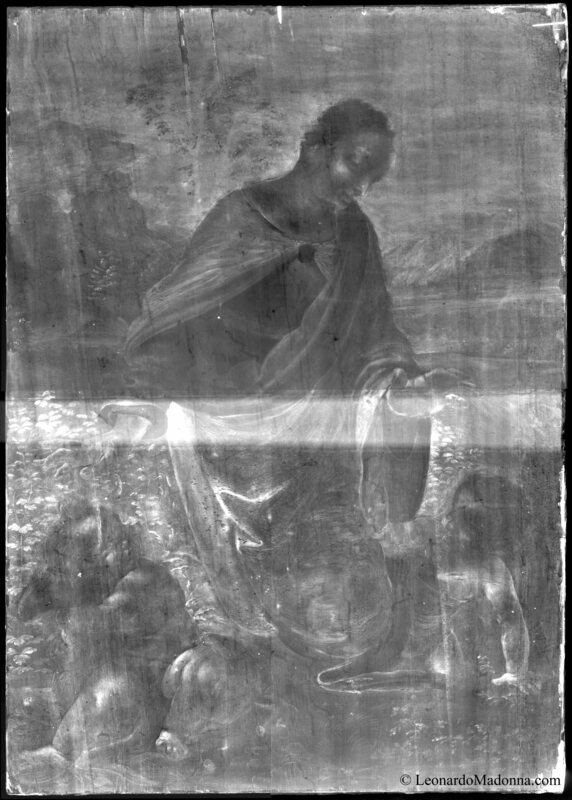 Since in the reflected infra-red such drawing shows less contrast than pure carbon black, only those details that are covered with finer grinded or thinner layers of paint (of little opacity) can be detected. In case the silver point has been used we can see in IR only those particles of silver which undergone chemical oxidation, i.e. we can reveal the drawing only on the fragments where the paint layer lost its air-isolating properties. Fragment of drawing showing the modeled but not implemented details of landscape is given, for example, in Ill.10. X-Ray fluorescence (Olympus Delta Professional analyzer, Rh anode) provides strong indication that silverpoint is present on the drawing lines revealed in IR. Ill10 demonstrates XRF spectra collected on one of the lines and at 15 mm off the line. While on the drawing line spectrum we see silver K-series lines these lines disappear on the spectrum taken at 15 mm off the line. Quantitatively the silver content measured on the line happened to be 301parts per million while in the spot 15 mm off the line the silver content was below the instrument’s sensitivity limit of 8 parts per million. 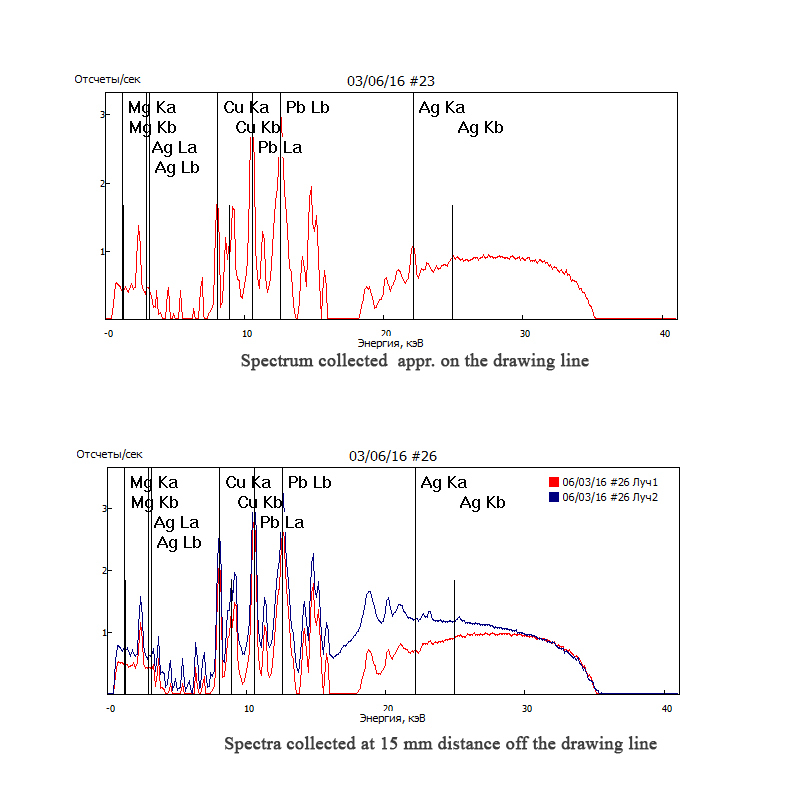 The 40 time difference in silver content on spectra with approximately the same contents of lead and copper make one uniquely connect silver with the drawing material. Ill.10. Infrared reflectography. Fragment. 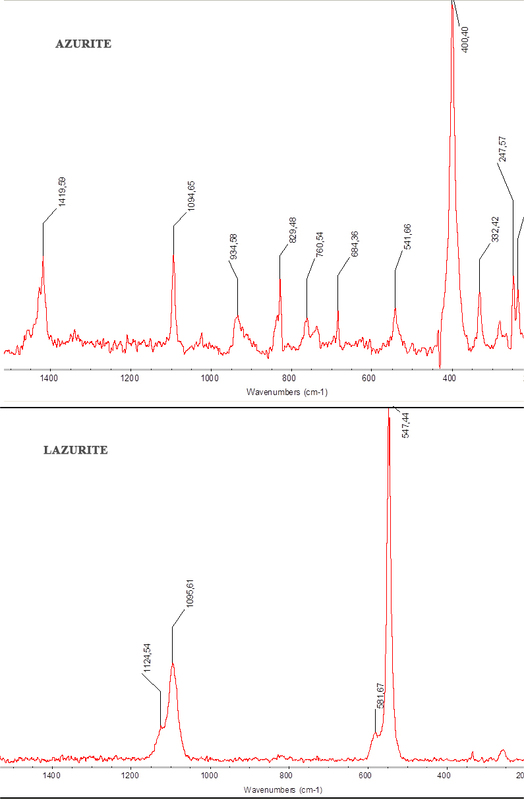 Presence of silver point drawing confirmed by XRF. Apart from the landscape details, this illustration clearly demonstrates thick and wide black outlines shaping the Virgin’s hand, the edge of her cloak, and other details. Those outlines might have been applied in carbon black by another artist who might need those lines to draw the reserves for in-painting the landscape around the figures. 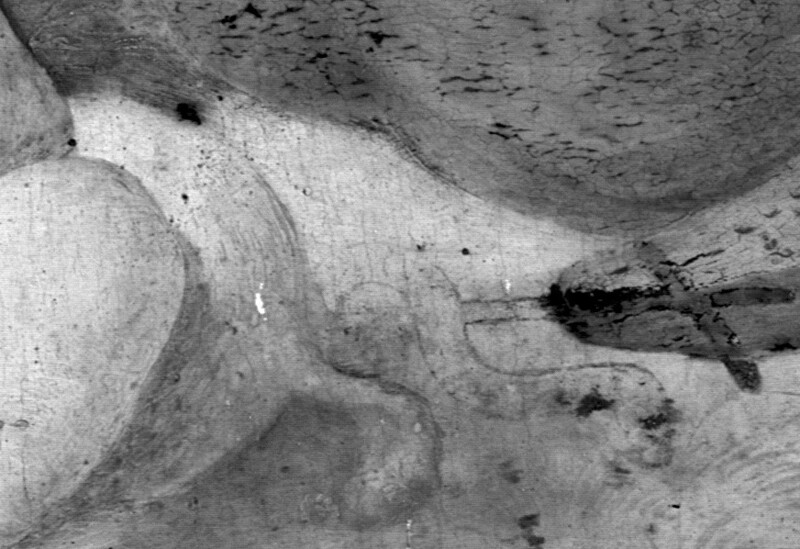 It is also to be remembered that in many of Leonardo’s drawings, the outer image contours (if compared with other parts of the drawing) are shown with rather thick lines. Fragment of the infrared reflectogram in Ill.11 reveals details otherwise not visible on the painting: the staff-like cross of St. John, narrow serpentine band-shaped cartouche to the right of the Lamb's tail and the nimbus around Jesus head. These details are visibly present on the Fernando Llanos's copy from Palazzo Pitti (Ill.4) and the copy from Château de Fleurs (Ill.5). The cross and cartouche are not present in two other compositional variants mentioned above. 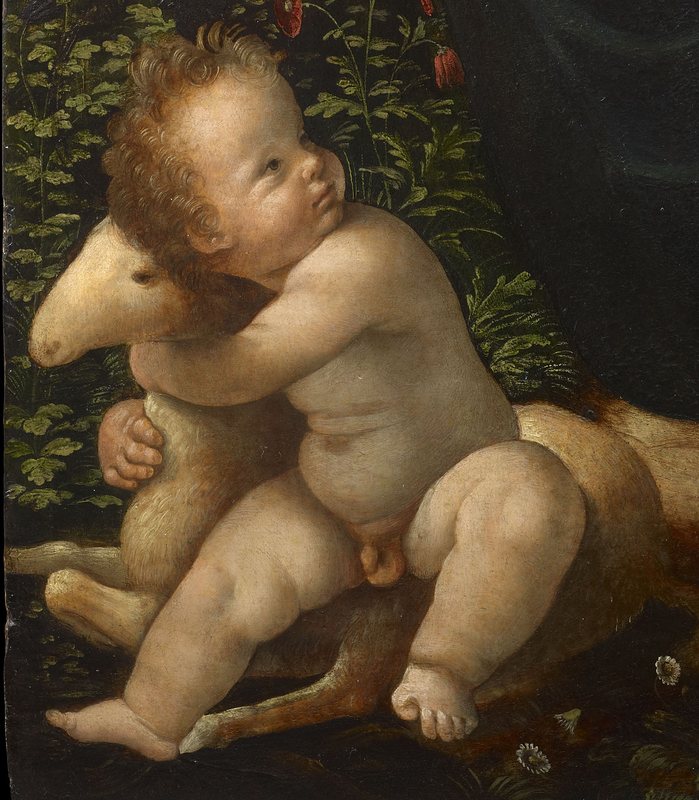 In the examined painting, these details were covered by the paint layer which was probably added at the date later than the painting's creation – perhaps, the author considered the attributes: Lamb for the Child, and the goldfinch for St.John – sufficient to distinguish the Infants. 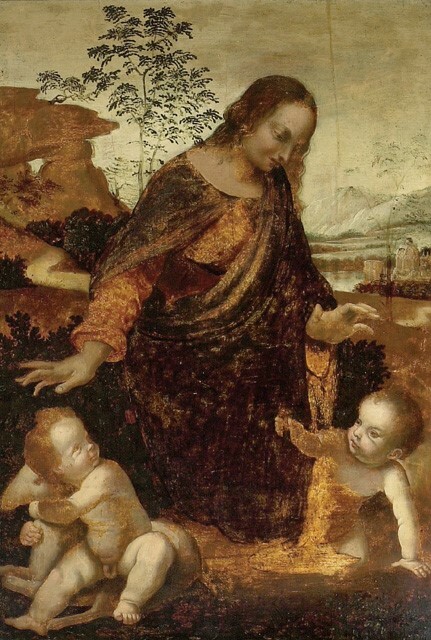 (One can recall here Leonardo's probable concept of the two Messiahs, which leads to certain ambiguity in the identification of the two infants in, for example, The Virgin of the Rocks from the Louvre, as well as to the similarity of both babies' faces – almost the similarity of the twins, excessive, in our view, for the first and second cousins​​.). It is worth recalling that inscription “Ecce Agnus Dei” on the band present on several versions of the painting, from our point of view, may not be appropriate for Leonardo, who, to the best of our knowledge, never mixed written and graphic languages in his paintings. From this point of view, the versions demonstrating the inscription may stand farer from Leonardo than those without such inscription. It is worth recalling that Larry Keith et al. ( Larry Keith, Luke Syson et al. Leonardo da Vinci. Paither at the Court of Milan. Nat. Galery Co., London. Distr. By Yale Univ. 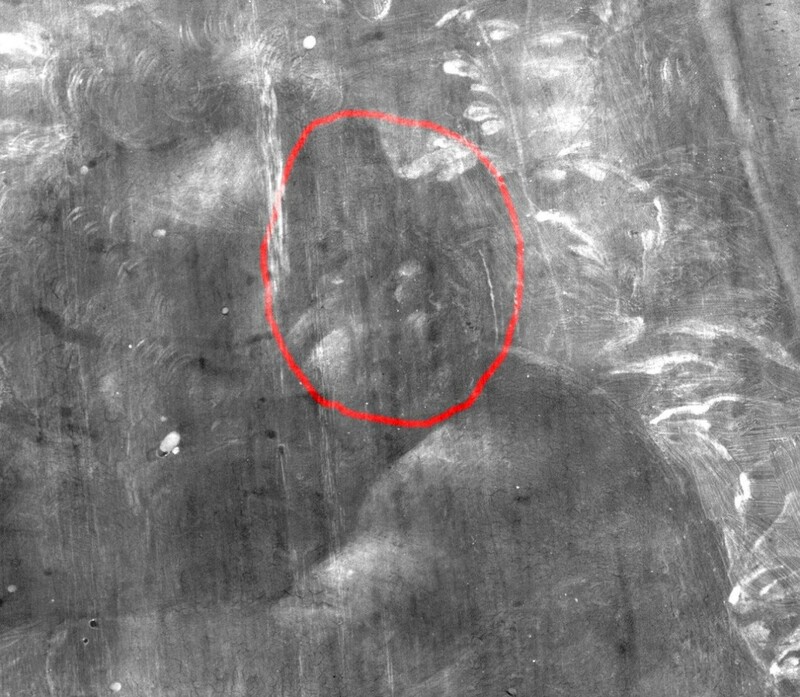 Press) discovered in reflected IR an original underdrawing in “Virgin in the Rocks” belonging to NGA, London, Ill.11a. Ill.11a. Virgin in the Rocks, NGA, London. Underdrawing discovered under paint layer. On the underdrawing Virgin’s face is turned left and her right arm is stretched forward quite similar to what we see on the painting under examination. That underdrawing, unknown anywhere else, seems to be one of the main reasons in atributing the London painting to Leonardo. The question arises if our painting could have been already existing by the time London painting was created? Ill.12 shows the assembly of four X-ray photographs. The X-rays clearly confirm the peculiarity of the painting, revealed by IR-reflectography. Thus, one can claim that the landscape and fragment of the Virgin's cloak were drawn independently, and were in-painted around the figures. This is especially evident in the study of Virgin's head and upper body, which in the X-ray look like they were ‘inserted’ into clothing. 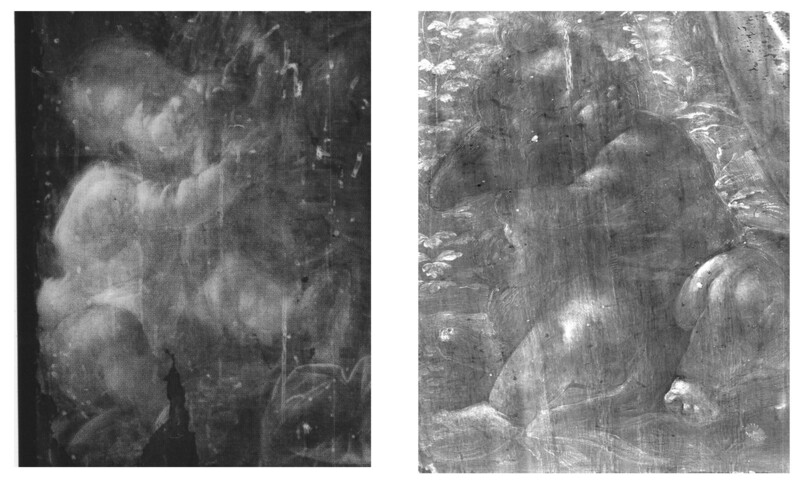 Combined with the reserve around the figures' contours revealed in infra-red examination, this trait clearly points that the painting was done in several stages: first, the figures appeared, and after that the landscape around them was created. 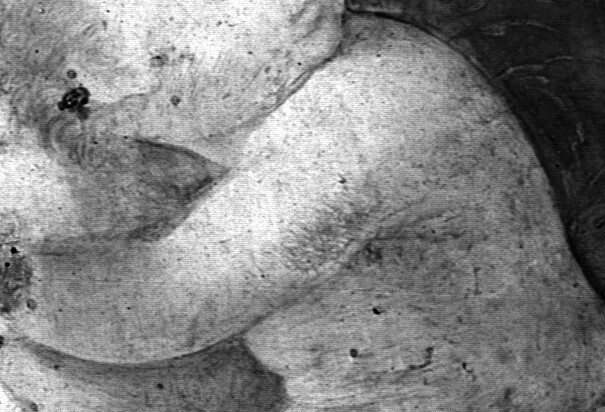 Blurred, spotted and slightly unfocused rendering of the head (especially its left part) and the torso of the Child gives enough ground to believe that the original version of the composition could be similar to the image of the boy hugging a lamb in Leonardo's drawing at Ill.7, where the lamb's head is turned to the opposite direction, and consequently the position of hands should have been different. Unlike the X-ray photo, these changes are not visible in the infrared, with the possible exception of the fleece (?) fragment that can be seen through the loss of white lead upper layer at St. John's shoulder (Ill.13). These changes were likely introduced by the author who executed the lamb at the stage of underpainting, as the quite poor floral ornament made with significant amount of white lead (unlike all other parts of the painting) was in-painted around the final version of the Infant's figure and the Lamb's head. High density (opacity) of paints in the floral ornament proves that the author sought to cover the pentimenti, and certain clumsiness of painting attests to the assumption that it could have been made by a different artist. Summing up all the above, it can be suspected that the Lamb and the background in-painted around it were initially absent from the painting. As for the head and face of the Child, its final version may be the result of multiple changes. For example, Ill.14b shows one of the possible initial variants of the face (for instance the Child’s mouth originally was open and possibly, he was looking more strait at the viewer) as revealed by the X-ray radiography. The X-rays also demonstrate considerable pentimenti in the depiction of goldfinch in the Child's hand, including changing the position of the hand. rendering of color shades which can be achieved through the use of sfumato – brownish haze of various degree of saturation, giving special subtlety to the color transitions. 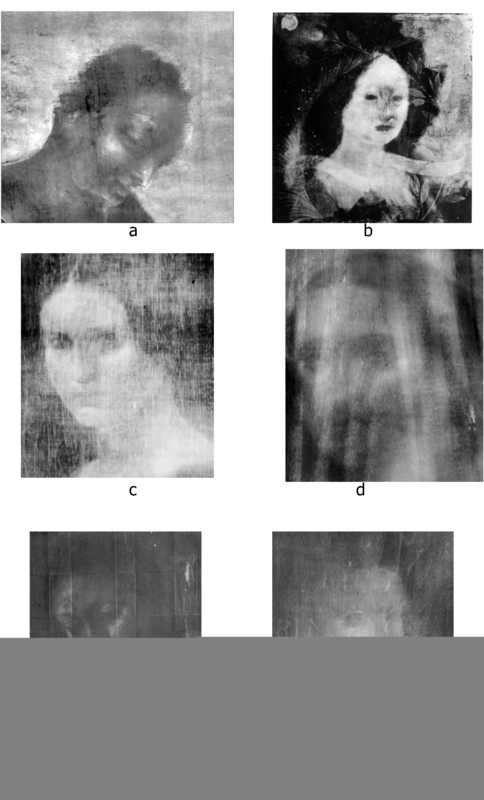 Leaving smart visual comparison to the art historians – specialists on Leonardo, we shall only point out that the X-ray photo of the examined painting in the manner of face rendering is most close in type to the photo of 'Virgin of the Rocks' from the National Gallery, London – the painting currently considered to be Leonardo's work. Ill.13. Infrared reflectography, fragment. Strokes of white lead visible in the loss area at The Child’s shoulder could be the traces of modeling the Lamb's fleece. Probably the Lamb's head was turned initially into another direction, similarly to Leonardo’s drawing. To draw further comparisons, it seems interesting to analyze the X-rays of the Infant's figures from the Madonna of the Carnation (Alte Pinakothek, Munich) and the examined painting Ill.14а. They undoubtedly demonstrate the similarity of manner in drawing the faces, modeling body wrinkles and shades, especially at the bellies. 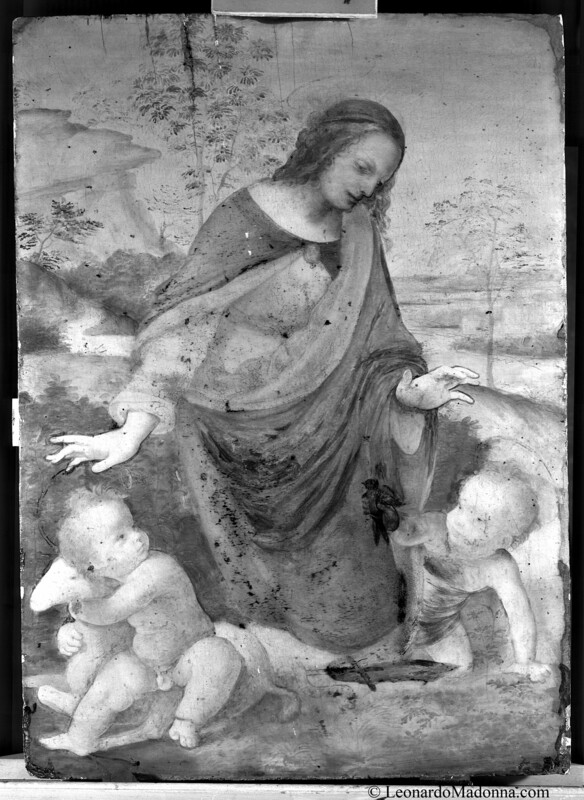 Given the observed similarity of the corresponding X-rays, it appears that the examined painting is closest to the manner of Leonardo as observed in the Madonna of the Carnation and the Virgin of the Rocks, i.e., Leonardo’s style in depicting childs was formed quite early, if we consider Madonna of the Carnation dating as 1478-80. 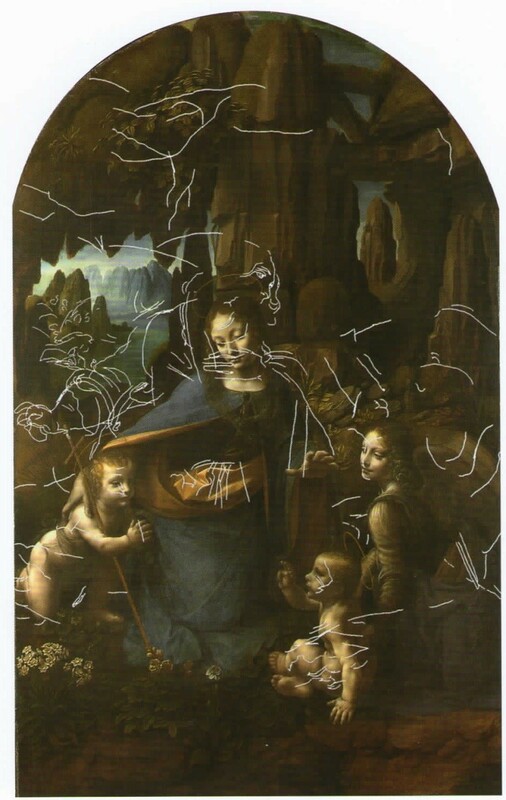 As to the dating of our painting we can probably base on above-mentioned similarity of Madonna’s face X-rays with the one from Madonna of the Rocks and also correspondence with the date of the drawing from the Metropolitan Museum with the Virgin and two Infants (the latter dating was originally believed to be1480–1485, but lately, considering the presence of “optical scale diagram” M.Kemp offered to move the dating into the second half of 1490s), Ill. 7. 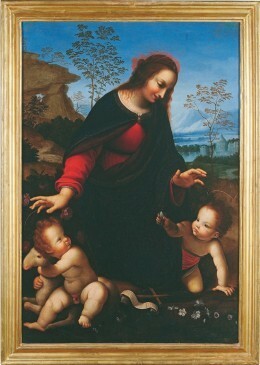 We believe, the painting could have been completed much later, possibly at the same time (or not long before) as the London version of the Virgin of the Rocks (1506–1508), which is directly or indirectly supported by the date of the drawing from the Getty Museum with the Child with the Lamb (1501–1506). The floral ornament around the head and torso of the Child and the head of St.John discords with the general image both in the character of brushstrokes and in the relative amount of white lead. This ornament can hardly be the work of the same artist who painted the figures and the landscape in the background. X-rays also reveal minor local losses of paint layer and holes in the panel left by insects, which may be significant for future restoration. We shall not dwell on these details in the present expert examination report. The UV-induced visible luminescence photograph is shown in Ill.15. zThe luminescence of the painting is uneven. The luminescence of varnish (majorly its top layer) is very intense in the areas of the Virgin's cloak and at the bottom of the painting, which indicates the age of at least 50–70 years. Numerous large areas or darker color, some of them in the shape of dark stripes, are visible against the background with intense luminescence. 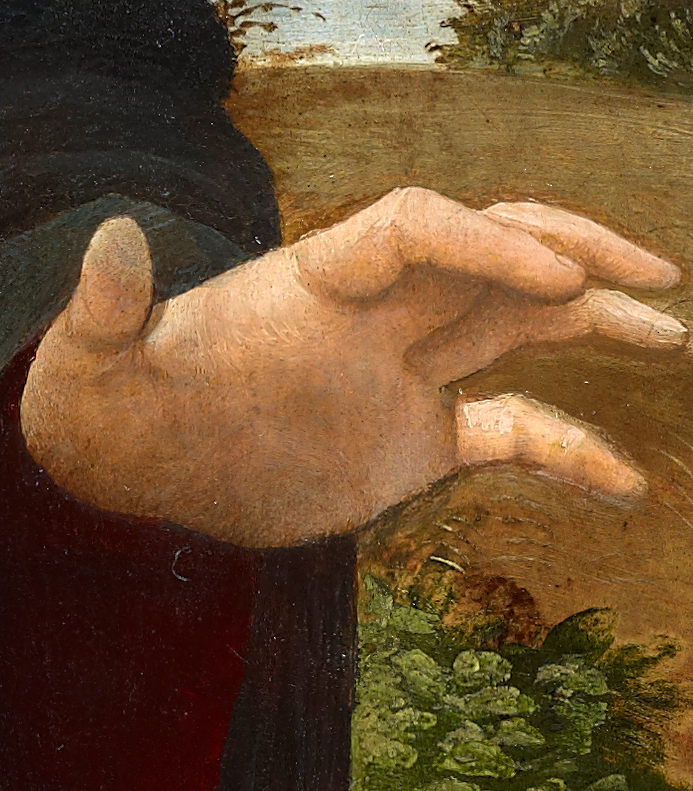 These areas may originate from the previous restoration attempt at thinning the varnish with a fairly large tampon or sponge, the marks (stripes) it left are clearly visible, for example, under the Virgin's left arm and at many other areas. The future possible treatment might attempt at restoring the darkened paint to its original blue color, at least at the Virgin's himation (cloak). At the same time, the areas of purple tunic (the chest and right sleeve) were cleared of varnish almost completely in the course of previous restoration in order to improve the color that had changed under the yellowed and darkened varnish. The crossection from the right shoulder of the Virgin clearly shows several layers of varnish on the surface, of which the fluorescence of majorly the upper layer is visible on the fluorescence photograph (Ill.15). 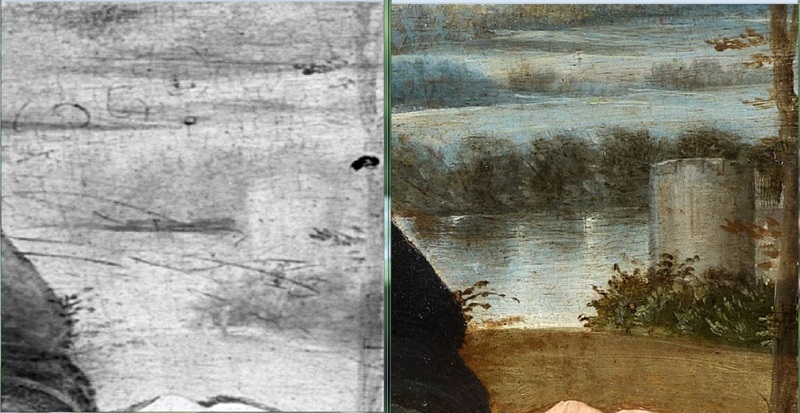 Varnish layer that covers the background of the painting (landscape, trees, rock) is more thin, if one compares crossections at Ill.8, 16. It seems that the top layer of varnish, the intense luminescence of which we observe, for example, in the Virgin's himation, on the background landscape has been previously completely removed or even never applied at all. This varnish layer has also been removed almost completely from the figures of the Infants and the Virgin's face, though its traces are still visible in the small luminescent areas (for example, on the breast of Infant Jesus). 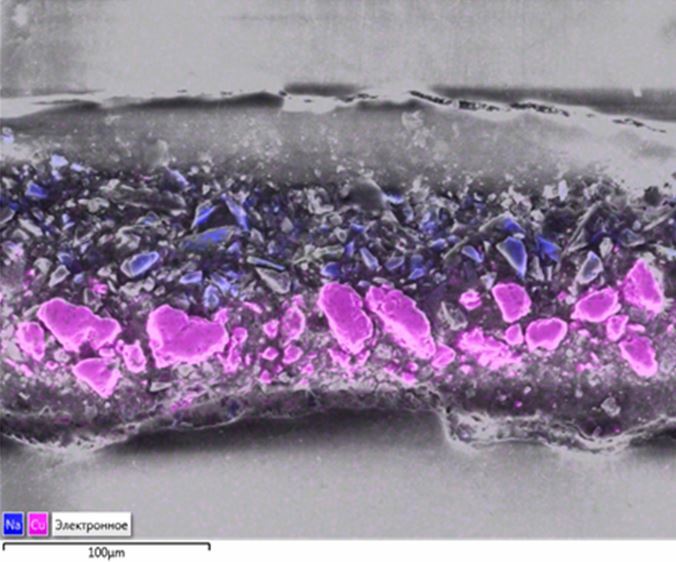 It is interesting to notice that Crossection Ill.III.16 under SEM-EDS as we examined it recently demonstrates two layers of blue paint – the first is natural azurite as the second, laying above, is natural lazurite (lapis-lazuli). Doth pigments were identified with Raman microscope Senterra (Bruker). Spectra are shown on Ill. 17.The mapping III. 18 demonstrates pigments positions quite clearly. We have found as well that azurite is associated with lead white and, probably, with oil binding media while lazurite is not containing lead white and its binding media should have been tempera. Such conclusions may confirm what was established on this painting by other researchers, see above. Ill.18. Crossection, cloth at the Virgin's right shoulder. Mapping with SEM-EDS (Zeiss, EVO MA-25 instrument). Azurite (Cu) –pink color, Lazurite (Na) – blue. The lazurite layer, except Na, Si and S contains other elements (K,Ca, Fe) which indicates presence of minerals associated in nature with lazurite that confirms its natural provenance. 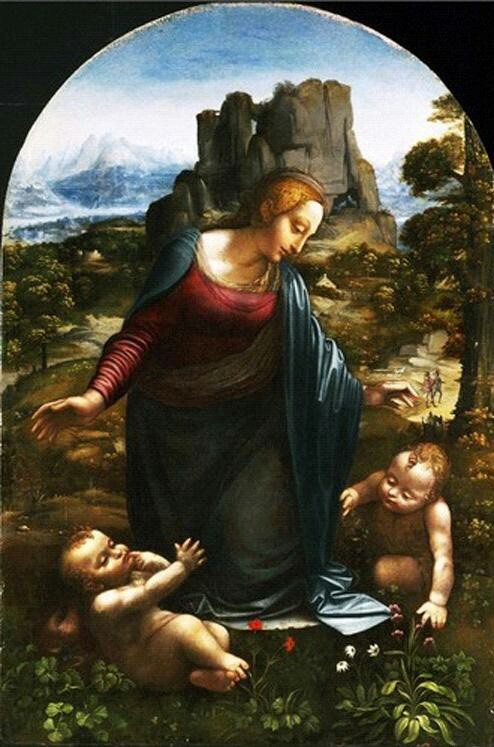 The examined painting Virgin and Child with Infant St. John the Baptist has to be defined, from the technical point of view, as the work by Leonardo da Vinci and his workshop. There is certain evidence proving that the work on this painting was implemented in several stages. At the first stage, the underdrawing (with silverpoint) was done and figures painted; at the second stage the landscape (or at least its major part) and the background were painted around the figures. The third stage involved possible changes to the representation of the Child, the Lamb, and John's attributes, and in-painting the floral ornament to the figure of the Child and on the relatively small area to the left from St.John. Among the known existing paintings on the same subject, the present painting seems to be most close to the works of Leonardo himself, which may be due to the fact that in this case Leonardo created the underdrawing and modelled the figures while one of the artists of his circle completed the work. It is worth mentioning here that Leonardo was, above all, a famous master of silverpoint works and, as it is well-known, he taught his students that very specific technique. The assumption that unfinished work by Leonardo has been used as a base for our painting seems probable, due to the absence of the known existing original or at least full-scale cartoon while numerous copies dating from the late 15th and early 16th centuries are present. Indeed, it is hard to imagine that the composition has been developed and made into a painting by some other artist on the basis of known to us and mentioned above very small and schematic Leonardo’s drawings and that later such, secondary in general painting would be repeatedly copied by the artists of Leonardo's circle. The version of the unfinished painting by Leonardo is particularly viable in view of the master’s well-known habit of either leaving his unfinished works set aside for many years. - thirdly, T. Borenius did not know about the painting reviewed in this report. Its level of performance is higher than that of the Ashmolean version, and moreover, it demonstrates silverpoint underdrawing and clearly identified stages of creation. 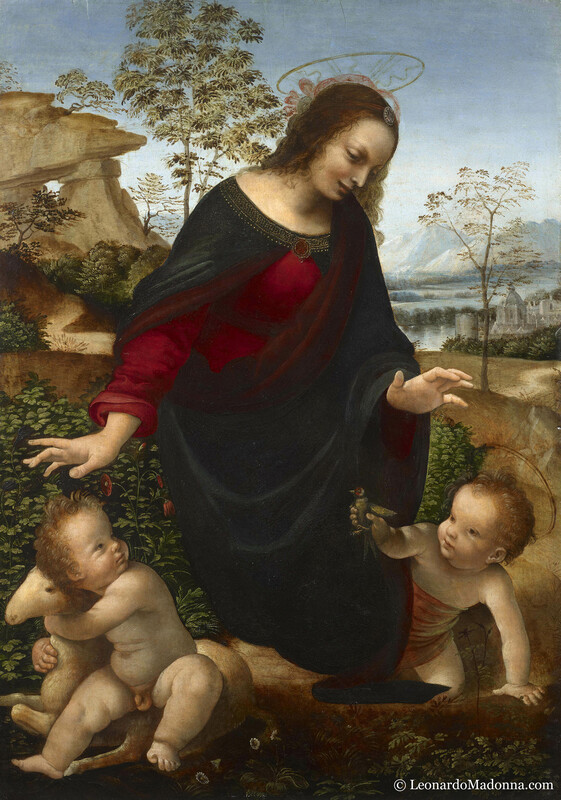 The completion of the work apparently coincides with the drawings of the Child with the Lamb (dates vary between 1500 and 1506) and the completion of the Virgin of the Rocks from the National Gallery (1506–1508). The similarity revealed by the X-rays in the manner of painting the figure of the Child on the examined artwork and the earlier Madonna of the Carnation is an interesting point. 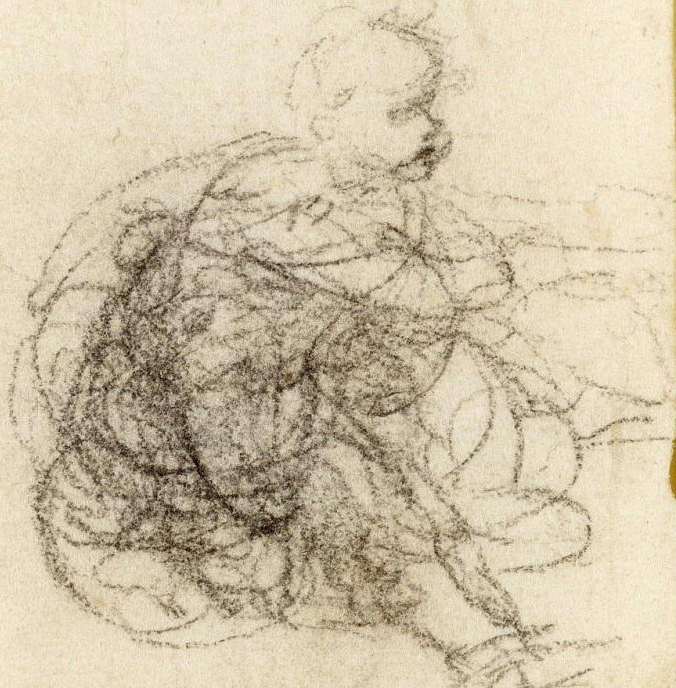 It looks as if Leonardo’s manner to render Childs figures formed quite early – by the time of creation of Madonna of the Carnation, i.e. by 1478-80. The already mentioned pentimenti of the face (and possibly figure) of the Child as well as the turn of the Lamb's head, attesting to the later changes introduced to the original composition, may provide the possible key to explaining the significant time difference between the introduction of the painting's constituent elements. Furthermore one may think that our painting has been created in Florence taking into account the fact that almost all paintings by Leonardo and his studio performed in Milan were made on walnut panels (probably Lombardian walnut) and on lead white ground (see Leonardo Da Vinci Salvator Mundi, Christie’s, 2017, after the London National Gallery studies) while the panel of our painting is poplar and the ground is gesso. Rather poorly-done floral ornament, in-painted around the figures of John and Jesus, probably belongs to some other artist of that time. As for St. John's staff-like cross and cartouche (which was destined to carry typical inscription Ecce Agnus Dei, seemingly not underdrawn - not revealed in IR here) on the earth at the foreground, those attributes have been closed. The artist considered them redundant in final composition. We must repeat that the inscription itself would not be specific for Leonardo who, as we believe, would not combine written and graphical languages in a painting (it is not known about him anyway). From this point of view, the versions which do not contain text might be closer to Leonardo than those clearly demonstrating such inscription. It is worth recalling that a viewer can have doubts in identifying the Infants personalities on the painting. In our analysis we accepted that Jesus embraces the Lamb while St. John passes to him the Goldfinch – another symbol of Christ Passions. But the subject can be interpreted in opposite way – the Infant with a Goldfinch can be Jesus and the one with the Lamb – St. John. If one remembers that closed St. John’s attributes are located closer to the left Infant, taken in our interpretation as Jesus, it can be logical to take the left Infant for St. John. But, in general the presence of closed attributes as such does not clarify much or helps much in interpretation and this, perhaps, was original idea of Leonardo. 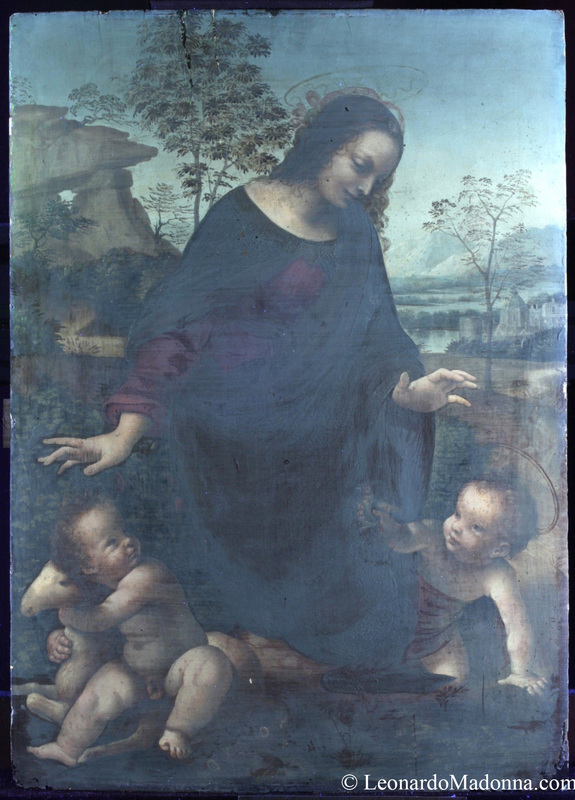 Given similarity between the Infants Jesus and John, some obvious semantic parallels with Leonardo's uncanonical concept of the existence of not one but two Messiahs come to mind, the idea that has probably driven the commissioner (Brotherhood of the Immaculate Conception) to reject in 1483 Leonardo’s Virgin of the Rocks (the Louvre). If we consider the analyzed painting to be the source for all other copies, we should believe that it must have remained for some time without any attributes of the Infants, followed by the period with all of St. John's attributes when the Pitti Gallery and Château de Flers copies were taken from it. As for the copy from the Ashmolean Museum, it could have been done after the staff-like cross and the cartouche disappeared from the painting.